I’m a fan of stories told from a side character’s perspective. I just found out these are called parallel novels, and that there is a list of them on Wikipedia! Looks like I have a new reading list. These stories include Goliath, Grendel, Rosencrantz and Guildenstern are dead, Barrabas, Foe, and others (I didn’t enjoy Wicked, but it wasn’t for the foundation but the author’s inability to tell an interesting story). 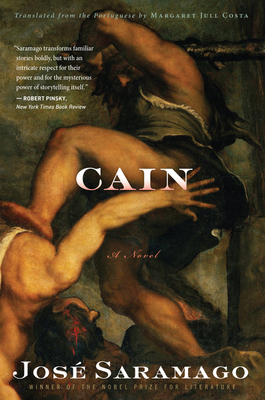 The most recent of these that I’ve read is Cain by José Saramago. In it, Abel’s murderous brother is taken on a tour through much of god’s greater Old Testament mistakes, from the Tower of Babel through to the Great Flood. In Cain, god isn’t the Christian-imagined, all-loving Father of the human race, but more of a middle-manager type, making everything up, literally, as he goes along. As for cain Saramago dispenses with capital letters for names in his novel, and so shall I here. , while he is selfish and self-serving, and while he did kill his brother (as well as a few others by the end of the novel), he’s portrayed in a largely sympathetic light, a simple man who’s been screwed over by god at every turn and is righteously angry at him. With these two main characters and the device of time travel, Saramago weaves an excellent, bitingly funny satire of Christian religion by pointing out the obvious inconsistencies in its conception of the deity. Yes, your god perhaps, but not theirs. Cain is the man who hates god.